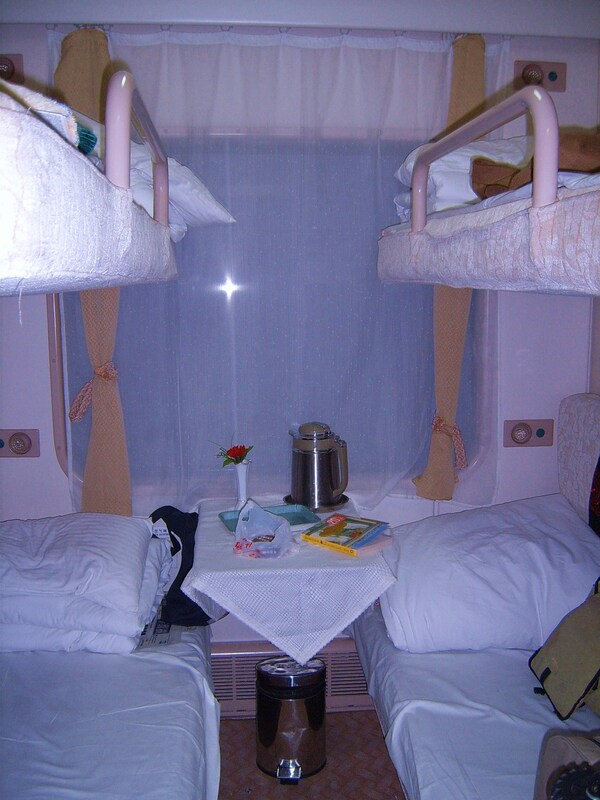 My Cabin in Beijing-Xi'an Train - my bag is on my bed and my book on the table. Well, here goes. The train ride was easy – a clean 4-bed unit, luckily I had bottom bunk. Only one woman in the unit spoke a tiny bit of English. A table cloth on the small table, flowers on the table and a kettle for hot water graced our cabin. I didn’t eat any of my instant dinners so I still have them for the trip back to BJ. Each bunk had its own movie screen and remote and earphones but only one movie had English subtitles. I watched it for a bit of cultural education and it was good. About the time of the revolution – a personal story about a single family. I fell sleep immediately after that and woke up 30 minutes outside of Xi’an. 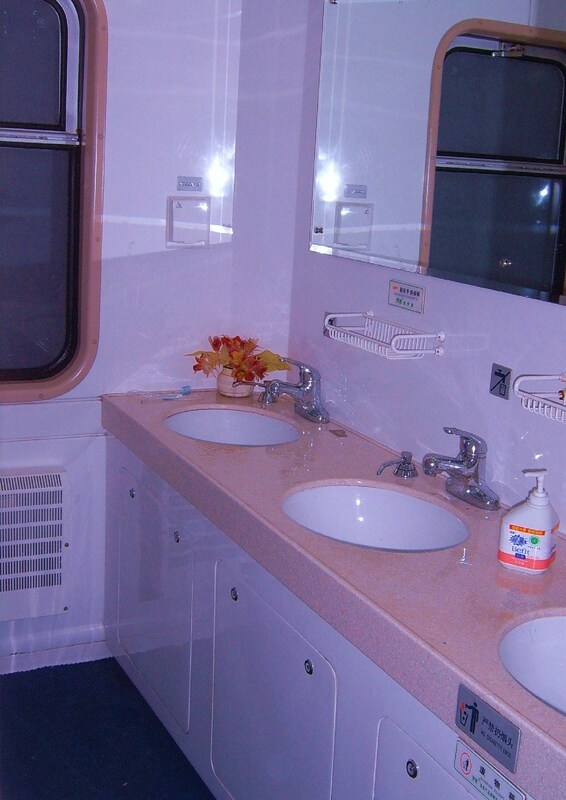 Sinks for washing up in the BJ-Xi'an train. When I awoke the next morning, I was first into the washing room. Look at how clean it is! The staff go in and clean after each person uses a sink. My host was waiting for me on the platform and that made navigation through the crowds easy. On the BJ side, my host’s friend’s secretary asked a Chinese tour guide to help me and he took me through the ticket checkpoint with the tour groups. That was before the crowds of Chinese so that was easier for me as well. Everything here is huge – the people are miniature and their buildings are giants. In Xi’an at the hospital, I met a French woman from Doctors without Borders (MSF – Medecins sans frontiers) who is working at a group home for street children. Her boss is Australian. And she was there too. 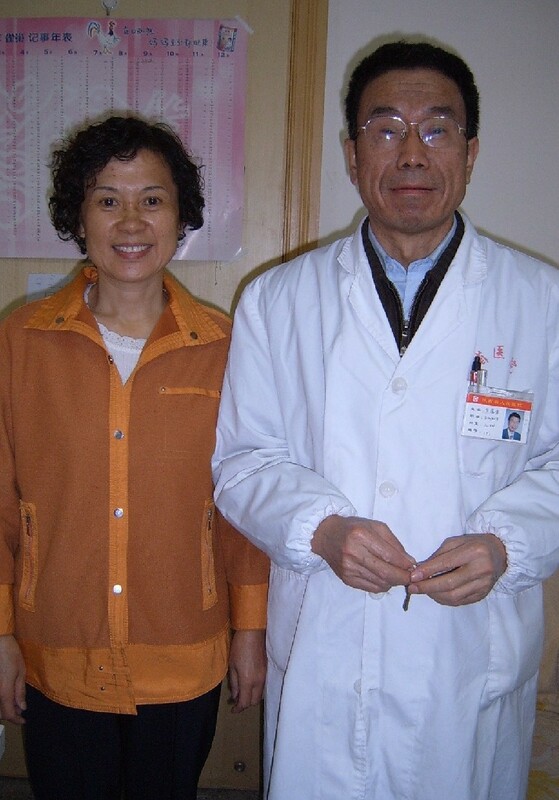 They invited us – me and Fuyong (my host) and his daughter Wenyan – to visit the group home in a town outside of Xi’an during the fesitval week starting October 1. I’m looking forward to that. We had lunch in a simple Chinese restaurant – I don’t mean Chinese food Chinese as that goes without saying – but a restaurant the Chinese themselves eat at. Simple and cheap. My host then took me for a walk downtown and I experienced pickpockets Xi’an style. Very professional. My camera was stolen and I didn’t even feel a thing. It is a good thing that a few days ago I downloaded all the pictures onto a CD. So the only photos I lost were the Great Wall photos and my name in lights. “Your name in lights?” you ask? Yes. When we came into the hospital through the main entrance yesterday – there was some Chinese writing and my name in Latin letters – all in neon on a huge sign. The sign said: “Welcome to the Israeli expert on children, Sheri Oz”. So now I am famous in Xi’an! Of course I took a picture of it. I was kind-of hoping that when the thief would see that photo he would realize he shouldn’t have taken it from such a distinguished individual and I would get a phone call that he had brought it to the hospital. No such luck!! Well, today I am sitting at Fuyong’s computer writing to you and, as there are no internet cafe’s in Xi’an, I will be dependent on this for writing to you. Coffee is hard to find here, so I bought some in the supermarket. Going to the supermarket here should be considered a major tourist attraction. It is amazing! I’ll leave that for another letter.